Start your journey of 12,300+ with the top 20 TED talks. 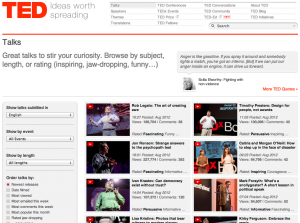 There are over 1,300 TED talks online. Combine that with more than 11,000 TEDx videos, (no, that’s not a typo), and the selection is pretty staggering. But have you ever wondered which TED talks get the most play? Well, fear not! TED has compiled a list of the 20 most viewed TED videos on their blog. Take a look at the link below and, while you probably won’t have time to watch all the talks out there, you can at least be sure you’re caught up the the TED top-20. 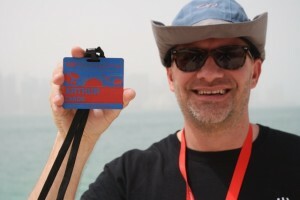 At the TEDx Organizers’ Workshop this February in Palm Springs, Arthur Zards gave a five-minute talk on name badges. In it, Arthur discusses a number of creative approaches to name badgery. Check out the following excerpt from his blog and be sure to attend TEDxSunnyvale on July 21st to receive a customized TEDxSunnyvale name tag of your very own. What’s XNet President Arthur Zards doing this week? Well, Arthur is at TEDActive 2012 in Palm Springs, California to inspire minds and exchange ideas worth spreading. The four-day program features many of TED’s famous 18-minute talks as well as short talks, music, dances, and other surprises. An interesting feature of TEDActive is the TEDActive Projects, a central element of the event focusing on having attendees dream, plan, and execute six projects to solve challenging problems and spark initiatives discovered at TED. Assisting in this endeavor are on-site topic experts and facilitators that move discussion and consolidate goals. Arthur signed up as one of these experts. His topic – name badges. A seemingly trivial part to any event or conference, a properly designed and personalized name badge can inspire networking and create conversation between strangers at an event, which is at the core of many conferences and events. Arthur outlines three rules to building a badge that will greatly increase the quality and reputation of an event.